This website content is for information purposes and is subject to change without notice. 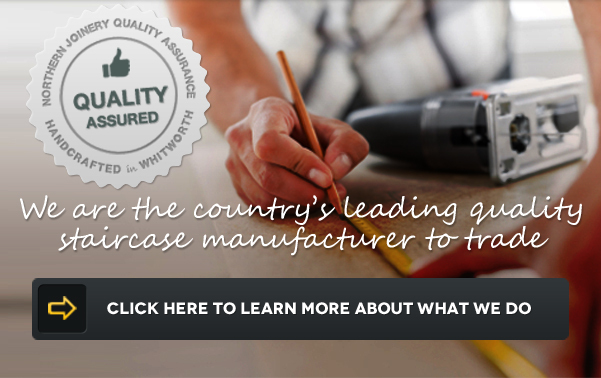 Northern Joinery Ltd does not provide a guarantee as to the accuracy of the information which is provided on the website. By using the website you agree that the information may contain inaccuracies and errors on the website of which we will not be liable for. Placing an order solely through the website is your responsibility to ensure that the products ordered are correct and meet your specifications. The details and software contained within the website are owned by Northern Joinery and any misuse or reproduction of any of the website may give rise to a claim in civil law for damages and/or criminal proceedings. Here at Northern Joinery we hand make all of our staircases and staircase accessories at our factory in Whitworth, Rochdale. When you place an order through our website we will ensure that all of the relevant paperwork is posted or emailed to you as soon as possible with no delay. We shall assign an order number to your purchase and inform you of it in the order confirmation. Please quote the order number in all further correspondence to us relating to your purchase. Once the order has been placed the contract is legal and binding. Your statutory rights, including your cancellation rights are unaffected. We understand that sometimes customers may want to change a specification of their staircase and as such, we allow for 48 hours from the date that the order is placed for the specification of the staircase to be amended or changed. Please note that after the 48 hours there will be a charge of 30% for the item that you wish to change on your order. This cost covers any charges incurred by Northern Joinery to process the changes, restocking and or manufacturing costs incurred by us. Ordering a staircase solely through our website with measurements provided by you is your sole responsibility and Northern Joinery will not accept any inaccuracies with the measurements provided. We would strongly recommend that upon taking the final measurements prior to ordering that you contact us to speak to one of our sales representatives. Furthermore, we accept no responsibility for the angles and dimensions by using our 3D Stair designer app; please note that this feature is intended for guidance purposes only. Within 3 working days of the order being placed we will advise you on an approximate date for your staircase, please note that these are estimates only and although we make every effort to ensure that the approximate delivery date is accurate, on rare occasions the manufacture of your staircase may be delayed through circumstances which are beyond our control. We will of course make every effort to keep you informed if this does occur. Northern Joinery delivers to all mainland UK, there will be a charge for the delivery, the cost of which will be calculated on the distance of the delivery, we will make you aware of the cost upon placing the order. We provide 2 delivery persons in order to ensure staircases are safely received. Within reason staircases will be off loaded to your chosen location within the property. We will advise and agree on a date of the delivery of the goods with you once the order has been place. Please ensure that on the day of delivery our delivery team can gain easy access to the property. Please check the goods to make sure that the products are correct and undamaged. In the unlikely event the goods delivered are damaged, do not accept the damaged goods and accept all items that are not damaged. We will then replace any damaged items as soon as possible. If you sign and accept the item and then later claim that there is a damage there will be an additional cost for delivery and collection for exchange of the goods. You will not be able to unreasonably delay or refuse delivery of the goods once the date has been agreed. If Northern Joinery is of the opinion that you the customer is not ready to receive the products on the date agreed or provide Northern Joinery with adequate instructions for the delivery of the goods, the customer shall be liable for any loss incurred by Northern Joinery by the refusal or inability to take delivery of the products and also for such costs and expenses that Northern Joinery may incur in storing the products if applicable. You can pay for your staircase online by debit or credit cards. Northern Joinery accepts no responsibility for money sent in the post and would recommend that this method is not used. As the staircase is designed and bespoke made for you, we require payment of the goods in full prior to the goods going into production, given that they are bespokley made for you. The goods remain the property of Northern Joinery until payment is made in full. Interest on overdue invoices shall accrue from the date that the payment becomes due from day to day until the date of the payment at a rate of 2% the base lending rate of Lloyds TSB Band Plc or pursuant to the Late Payment of Commercial Debts (Interest) Act 1998 whichever is greater. Once the order of the staircase has been made and the staircases have been placed into production we will not accept cancellation of the order given that the staircases are bespoke to you. The Distance selling Regulations do not apply to our staircases which are bespoke and custom made for you or if you have examined our product within our showroom. If the Distance Selling Regulations do apply you can cancel your staircase order by notifying us in writing before delivery of the goods, or within 14 calendar days from the day following delivery. Staircases ordered through our website where the measurements have been provided by you and not one of our sales representatives are made bespoke from your measurements and as such are non refundable. The contract between Northern Joinery Ltd and you shall be governed by the laws of England and any dispute between us will be resolved exclusively in the courts of England.